The BEST zucchini pizza crust recipe - low carb, super easy, 4 ingredients, NO squeezing required, and you can PICK IT UP! 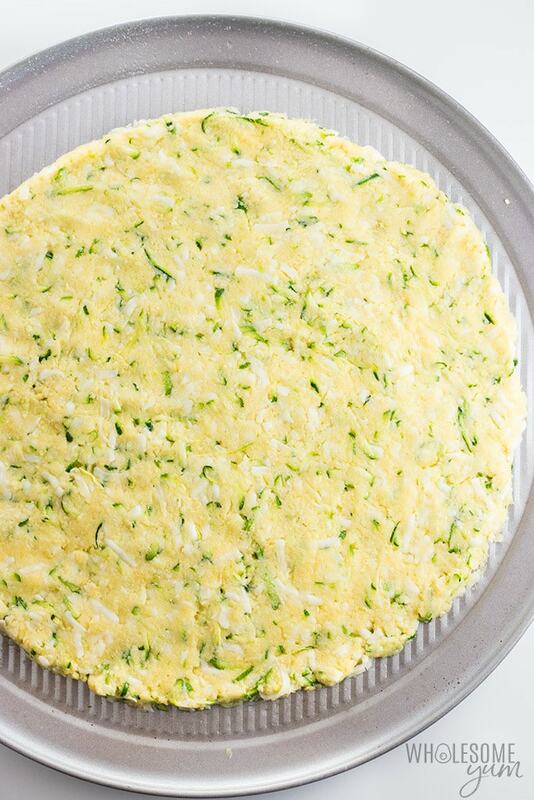 Plus, lots of tips and instructions for freezing zucchini crust pizza. After visiting Vienna, Salzburg, Prague, and Berlin, we’re heading to our final destination – Paris. I love French food to pieces, and I can’t wait to have some amazing foie gras and French liver pate. But, I have to admit that after all this time away from home, a small part of me misses low carb pizza. I made the best zucchini pizza crust recipe right before I left, and even though I’m going to enjoy every moment of my time in Paris, I do look forward to making it again. 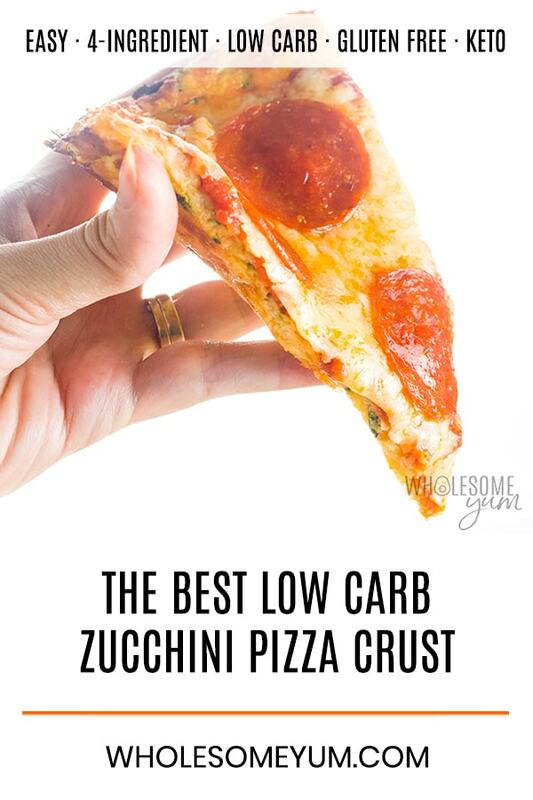 Low carb pizza is a big staple at our house. 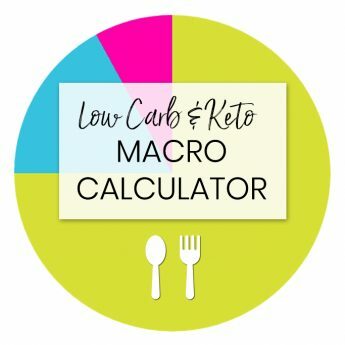 Aside from the classic fathead pizza crust, I regularly make cauliflower pizza crust, pizza stuffed mushrooms, and keto pizza casserole. If there’s a vegetable that can go with the flavors of pizza, you can bet I’ve made a pizza out of it. Zucchini crust pizza is just one of my many favorites. Unlike many heavy pizza crust recipes, this one is very light – just 83 calories and 2 grams net carbs per slice. Best of all, this low carb zucchini pizza crust recipe is one where you can actually pick up the slices. Yay! Just let them go from piping hot to warm to pick them up more easily. If you saw my post this summer about how to make zucchini noodles, you know that one of my two favorite ways to make them is in the oven. It dries them out beautifully, so they aren’t watery, without the tedious process of squeezing out the water. Well, guess what? The oven drying method works for low carb zucchini pizza crust, too! When I discovered this, it was a great reason to write a post about it. I was so excited to share this method with you! Here’s how it goes. Simply shred the zucchini, sprinkle with a little salt, and dry it in the oven… for the most effortless zucchini crust pizza you’ve ever made. Dry the zucchini in the oven. As mentioned above, the key to this zucchini pizza crust recipe is to dry the shredded zucchini in the oven. The approximate time is 10 to 15 minutes, but can vary depending on your pan, your oven, even your zucchini. Pat the zucchini dry with paper towels after removing from the oven. Even though the oven does most of the work for you in drying, it doesn’t hurt to pat the shredded zucchini lightly with paper towels. This is nowhere near the effort of squeezing, which you don’t need to do! It’s just a quick pat-down, and takes all of five seconds. I’ve had a few people have issues with this when making other cheese-based pizza crusts, so wanted to mention it here. Like the others, make sure to use hard mozzarella when making this one. Do not use fresh, soft mozzarella. It’s too watery and the end result won’t be sturdy enough. As long as it’s hard mozzarella, it doesn’t matter if it’s full-fat or part-skim. You can also feel free to use either pre-shredded or shred a block yourself. Use coconut flour to absorb moisture. Sorry, you cannot substitute the coconut flour for something else in this zucchini pizza crust recipe. Coconut flour absorbs far more moisture than any other flour, so it’s a must to prevent the crust from being soggy or falling apart. Spread the zucchini pizza crust evenly. Make sure the crust is spread in a thin, even layer. It won’t cook through well enough if it’s too thick. Even worse, if the thickness isn’t uniform, you’ll end up with parts starting to burn while other areas are raw. Just spread it as thinly as you can, approximately 1/4 inch (or very roughly 1/2 cm) thick. Let the crust rest before adding toppings. This is important! The crust will be pretty soft when you remove it from the oven, and prone to absorbing anything you put on top of it. You do not want this. When you let the crust rest for about ten minutes, the cheese will solidify, creating a barrier between the crust and the sauce. This will make the crust more sturdy and prevents the sauce from sinking into the crust. It’s super easy to make zucchini crust pizza ahead for meal prep. Just freeze it! To freeze, prepare the low carb zucchini pizza crust recipe as written on the recipe card, but don’t add toppings. Wrap it tightly in foil, and place horizontally in the freezer. Once it’s hard, you can move it to a vertical position or anywhere that’s convenient. When you are ready to make zucchini crust pizza with the frozen crust, do not thaw it. 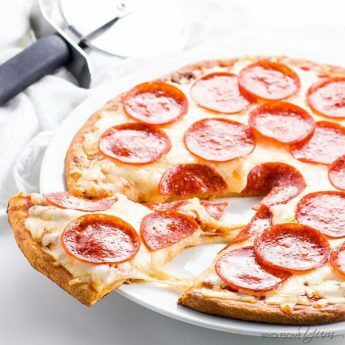 Simply add the sauce and toppings to the frozen pizza. Place in the oven for 15 to 20 minutes at 400 degrees, until the pizza is hot throughout and the cheese is golden. 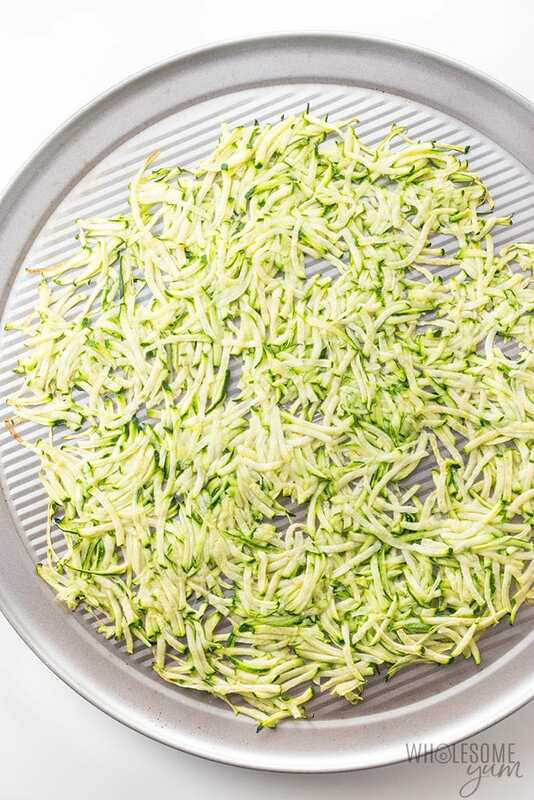 Spread out the grated zucchini onto the pan in a thin layer. Sprinkle very lightly with a little sea salt (not 1/2 tsp, this is just a light sprinkle). Bake for about 10-15 minutes, until zucchini is semi-soft and fairly dry. Meanwhile, combine the eggs, mozzarella, coconut flour and 1/2 tsp sea salt in a large bowl. When the zucchini is done, pat the dry as well as possible with paper towels. Mix into the bowl. Lightly wipe down the pizza pan to get rid of any stuck on zucchini. If it's not very good non-stick, line with parchment paper. 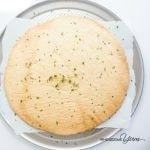 Grease the pan or parchment paper. Remove the zucchini pizza crust from the oven. Increase the oven temperature to 400 degrees F (204 degrees C) and let it preheat. Let the crust rest for 10 minutes at room temperature, then top with thick sauce and toppings. Return the zucchini crust pizza to the oven for about 10 minutes, until the cheese on top melts. If desired, place under broiler for a couple minutes to brown the cheese. If you want to pick up the zucchini crust pizza to eat it, this will be easier to do when the pizza is warm but not piping hot. Click or tap on the image below to play the video. 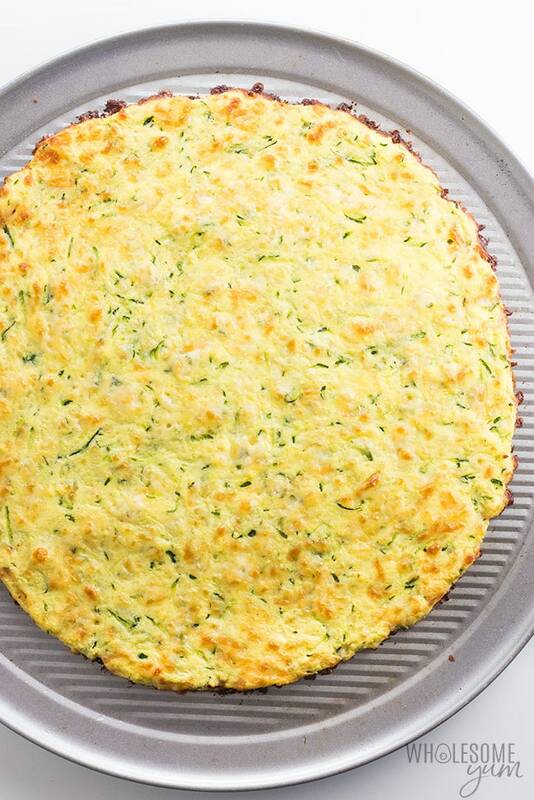 It's the easiest way to learn how to make Zucchini Pizza Crust! 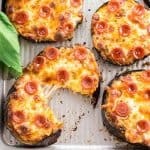 This recipe sounds like just what I needed to quench my Pizza cravings. I am going to make them in personal pan size for individual convenience and easier to get in my freezer. Thanks for the recipe! Worked like a charm and it’s super DELICIOUS! I folded the crust over my filling and made a 6-piece calzone! Is the calorie count just for the crust itself? Hi Trista, Yes, then nutrition info is the crust only. I made this but skipped the oven step. 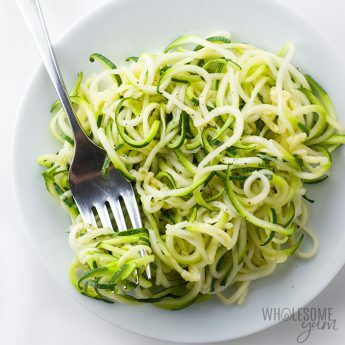 I could not get my spiralizer to work so I grated the zucchini, salted it and squeezed out the water. I had half the required zucchini so I halved the recipe but used 2 eggs and added a couple of healing tbsp more of the coconut flour. I also flipped my thin crust to cook on the bottom for 5-7 minutes at 400F but I don’t think that that was necessary. With pesto as a sauce, it worked like a charm despite skipping to prebaked shreds. I live in a place where I share the kitchen so I’m glad this worked and I trust the original recipe is perfection! Thanks for sharing such a great recipe! This was great! I felt like I was eating actual pizza for the first time since I started Keto a few months ago. I’ve tried other recipes that ended up soupy and mushy. 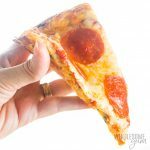 I could actually eat this crust without having to use a fork! My carb loving husband even approves! Thank you for this recipe! Hi Joseph, Yes, you can freeze it. Just pre-bake it before freezing, and add toppings to the frozen crust before baking. No need to thaw first. This looks so delicious! I’m out of coconut flour though… can I sub for something else? Hi Chana, Sorry, this recipe needs coconut flour to balance the moisture of the zucchini. Other flours won’t work. You could try cauliflower pizza crust instead, which doesn’t need flour of any kind. Quest unflavored protein powder can be subbed in any recipe calling for coconut flour. Its a one to one substitution. I’ve yet to find a recipe where it didn’t work. Hi Jenn, Protein powder generally is not nearly as absorbent as coconut flour, so I don’t usually recommend that replacement, but have not tried this specific brand. 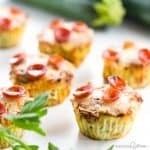 Can this be done with frozen shredded zucchini? Hi Penny, I haven’t tried that. It should work, but you’d need to thaw it and squeeze out the moisture. The pizza is great, thanks ! The nutrition facts are for the crust only right? Thank you, Eva! Yes, nutrition info is for the crust only. I am wondering if I can substitute the coconut flour to Almond flour? I have a Coconut sensitivity ! Loving your recipes all the from down under.. New Zealand ! Hi Kaye, No, sorry, the coconut flour helps offset the moisture from the zucchini, and almond flour won’t do that. There are ways to make zucchini crust with almond flour but it’s not simply a swap. 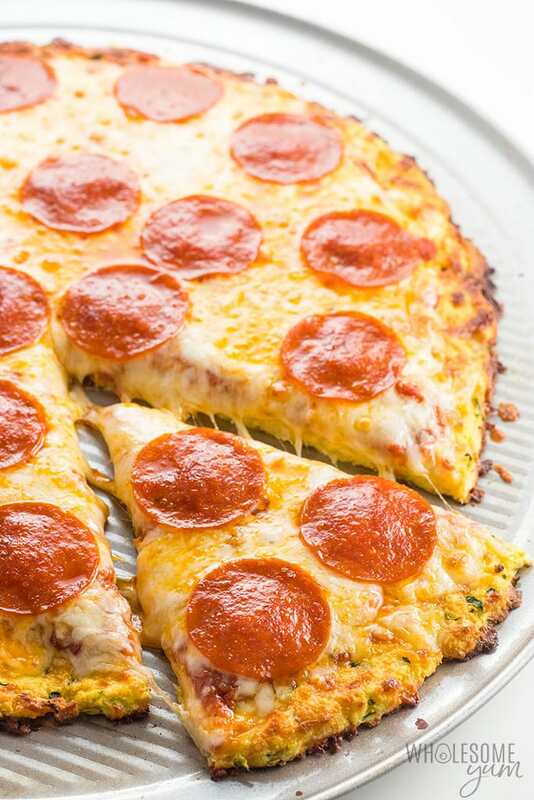 You might like this cauliflower pizza crust recipe instead which doesn’t require any flour. I tried it with cornstarch and it was perfect!! I can’t have coconut flour. Thank you so much, Connie! I’m so glad you like it. If you have Instagram, you can share a picture and tag @wholesomeyumblog or use hashtag #wholesomeyum. OKAY IM JUST GOING TO SAY THAT MY ENTIRE FAMILY LOVES THIS PIZZA. DEFINITELY A NEW FAMILY FAVORITE! I am so happy to hear that, Genieve! Have a great day! Does this taste eggy? 3 eggs seems a lot. …? Hi Tere, No, I don’t think it tastes eggy. The eggs bind it together. Hi, thanks so much for all of the awesome healthy recipes. You’re welcome, Deb! Hope you like the pizza! Wow this is really a great tasting crust. Finally get to have pizza again… I have missed my pizza haha thank you! I am so happy you liked the pizza crust, Connie! Please come back soon! Making it for the first time. Can’t wait! Hope you love it, Connie! OMG I HAVE PIZZA!!!! I finally made this and it is DEEEElicious! I added a 1/4 tsp of garlic powder and 1/4 tsp Italian seasoning to the dough mixture. Topped it with Rao’s pizza sauce, a four cheese pizza blend and pepperoni and I am IN HEAVEN!!! The only thing I will do differently next time is not use the parchment paper. I have a Calphalon pizza pan that has holes in it and I thought the crust might be too moist to place directly on the pan, but it wound up a little too moist on the bottom. Next time (and there WILL be a next time!) I will forego the parchment paper and just put a cookie sheet on the shelf below the pizza an in case there is any leakage. Thank you sooo much for a fantastic recipe! I’m so glad you liked it, Marcelle! I use the parchment paper on a pizza stone and it doesn’t end up moist on the bottom that way, but I can see how there would be a higher risk of that on a regular pizza pan with parchment paper. You can try spreading the crust on the pan directly, but there’s a chance it might stick, and you’re right that it might leak also. I’d grease it well first if you do that. Oh! I completely forgot that I have a pizza stone! Lol! 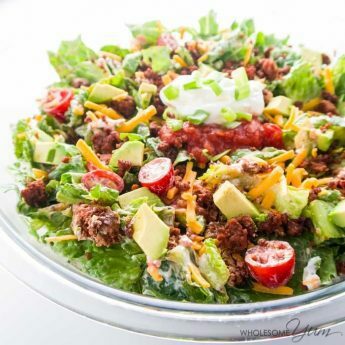 Could you do this same recipe using yellow squash? My garden is prolific with yellow squash this year and I am running out of ideas on how to use it! Hi Jen, Yes, absolutely! You can follow the same recipe and use yellow squash instead. Planning on making this today. Can I refrigerate the leftovers? Hi Marcelle, Yes, definitely! Hope you like it. 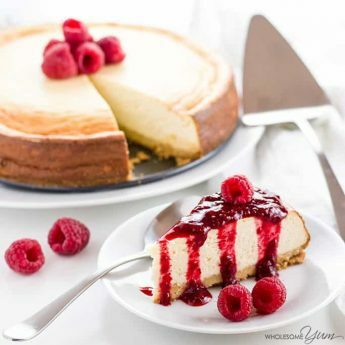 I am in love with this recipe, you are a genius! I added sliced mushrooms, sliced tomatoes and basil to ours and at first my husband was turning up his nose….until I served it to him ..AND, He said honey this is delicious!!! It was so dang good I am making it again tonight! I am so happy you liked it, Juliette! Thanks for stopping by! 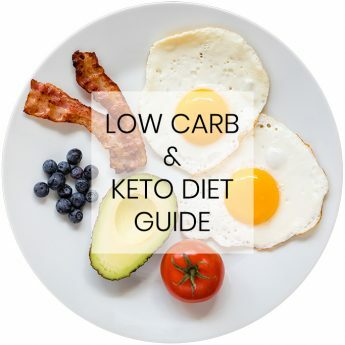 I’m relatively new to Keto and, although I was fine for a while surviving on eggs, chicken, avocado and bacon, I’m now finding I need the substitutes for my old favourites to stay on course (I can’t imagine life with no more pizza, blueberry muffins, and ice cream!) and I just wanted to say how much I love your site! Particularly appreciate the nut and dairy free options, as I’m trying to bring some other diet-restricted members of the family on the journey with me. I’m in Australia by the way . Thank you from all of us! I am happy to hear that, Kirsty! Thanks for stopping by! Our Labor Day Weekend is looking dicey weather wise. I’ll be making pizza! Can’t wait to try this! I hope you like it, Marcelle! Thanks for stopping by! I read this very carefully, then see I can’t make this as I’m allergic to coconut. Sorry to hear that, Lois! 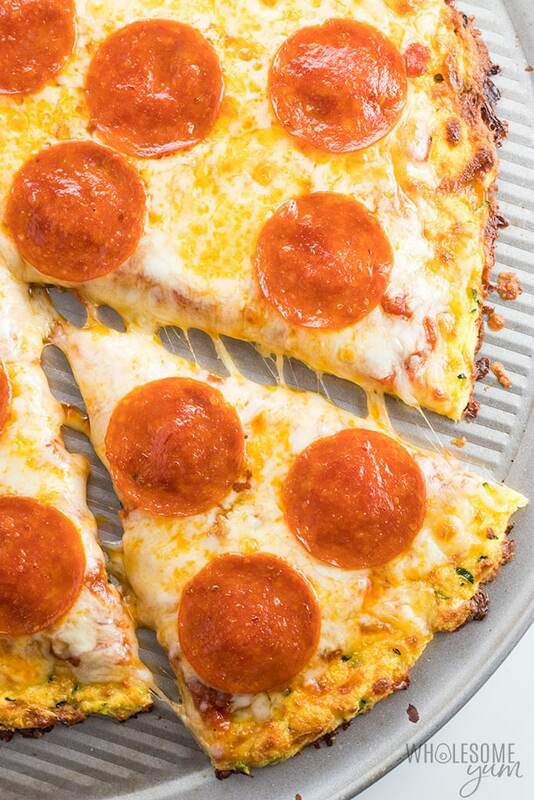 You might like this cauliflower pizza crust instead.